Have you ever wondered what the home of an interior designer looks like? We often admire the work of the experts, but what sort of home do they return to each evening? 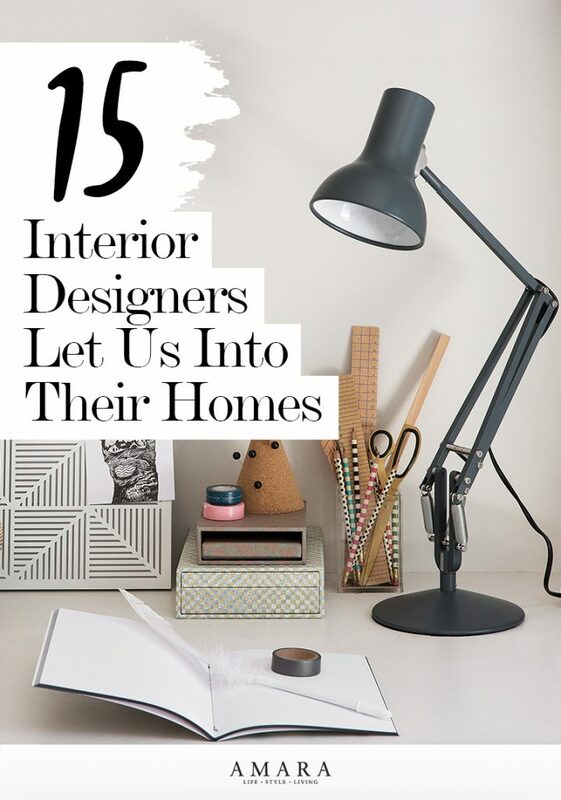 The LuxPad asked 15 of our favourite interior designers and stylists to give us a glimpse into their own homes, and we were not left disappointed! From stunning church conversions to contemporary kitchens, each space reflects the talent and flair of the designer and is guaranteed to leave you feeling inspired. 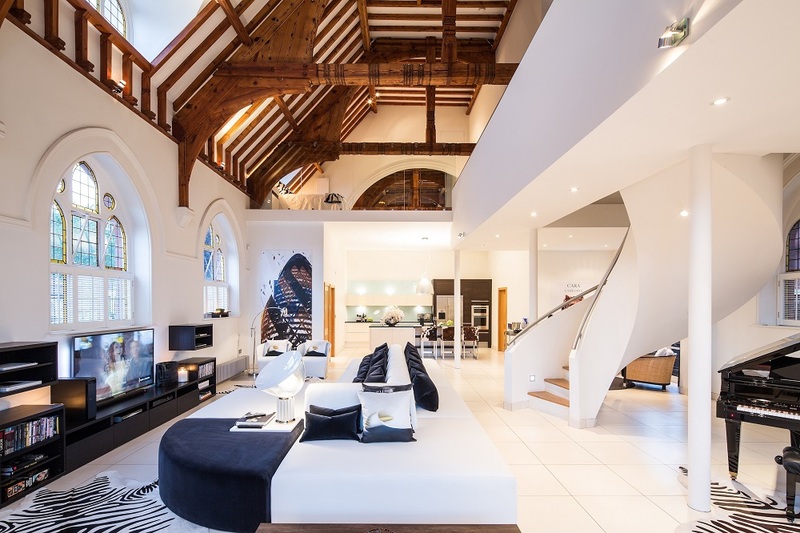 It’s hard to believe that this spacious church conversion sits in a busy East London borough. Now the home and office of interior designer Gianna Camilotti, great care has been taken to modernise the property while retaining the incredible architectural features. Black and white make for a contemporary colour palette that is mirrored throughout the open-planned property. The modern colours and furnishings contrast beautifully with the original church windows and exposed beams. Unsurprisingly, the stunning property has won several highly acclaimed international design awards. We love this glimpse into Anna-Carin McNamara’s living room. Simple and elegant, the room is carefully composed without feeling too thought through. 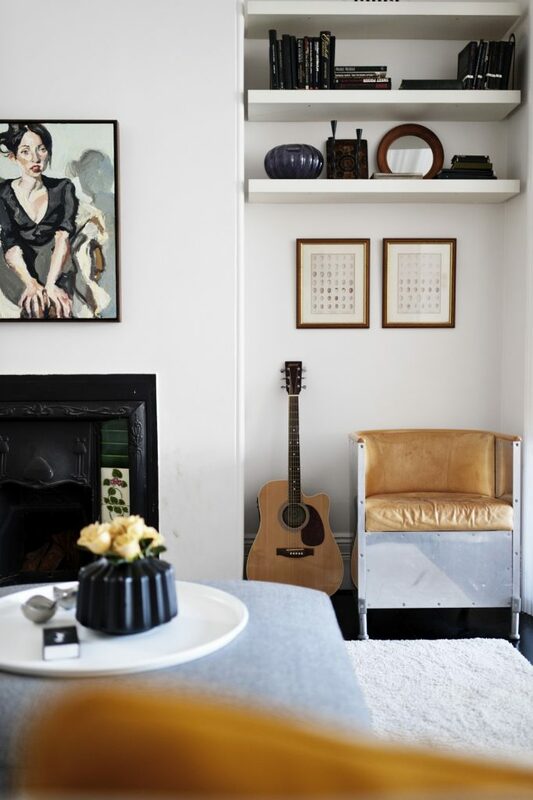 From the propped-up guitar to the interesting wall decor, each accessory complements another while keeping the living space homely. 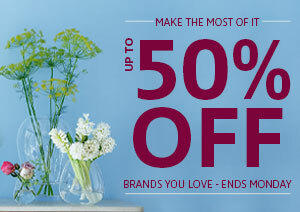 Pairing earthy yellows and browns with cool grey and white is a brilliant way to keep a room looking modern and fresh. 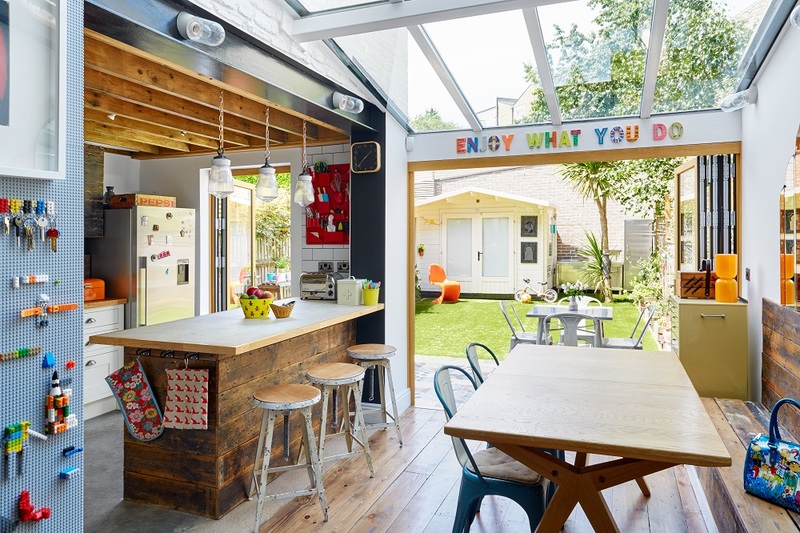 Dean Keyworth’s stylish living and dining area would make the perfect entertaining space. Flooded with natural light, the room feels particularly spacious. Plush carpets and textures adorn the walls and furnishings which add to the luxurious feel. We love the statement light fitting and the surprising pops of colour on the backs of the dining chairs and armchair. There are so many stand-out features in Sacha Berger’s gorgeous living space. 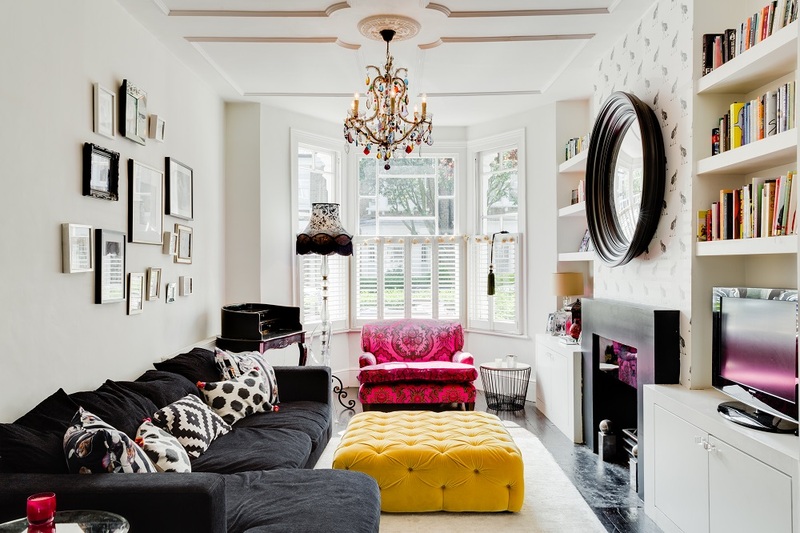 The statement chandelier with multi-coloured droplets is an unusual centrepiece, while the contrasting yellow footrest and pink armchair add interest to the space. 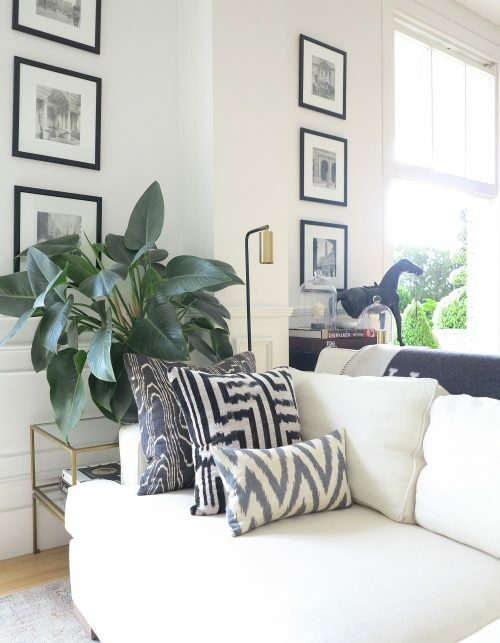 Take notes from Sacha about how to use a gallery wall in your living room – the photo frames, though mismatched, complement each other perfectly. 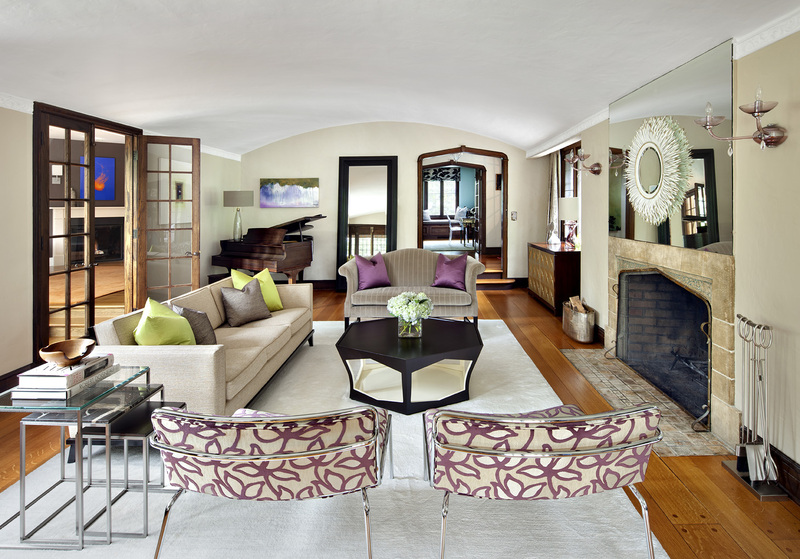 Claire Paquin’s immaculate living room makes effective use of such a large space. Bringing sofas and chairs away from the walls creates a more intimate seating arrangement, while the large rug provides a focal point to the room. Floor-to-ceiling doors and full length mirrors further accentuate the sense of space. A perfect entertaining room! Take inspiration from Jared Sherman Epps and create a tranquil bathroom space. The plants and candles clustered at the edge of the bath are very spa-esque and are guaranteed to help you relax after a long day. 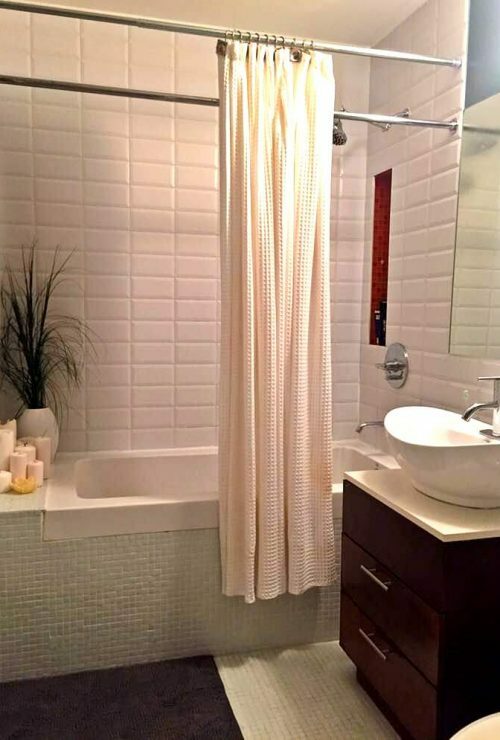 Crisp white tiles and a fabric shower curtain further add to the sense of luxury. 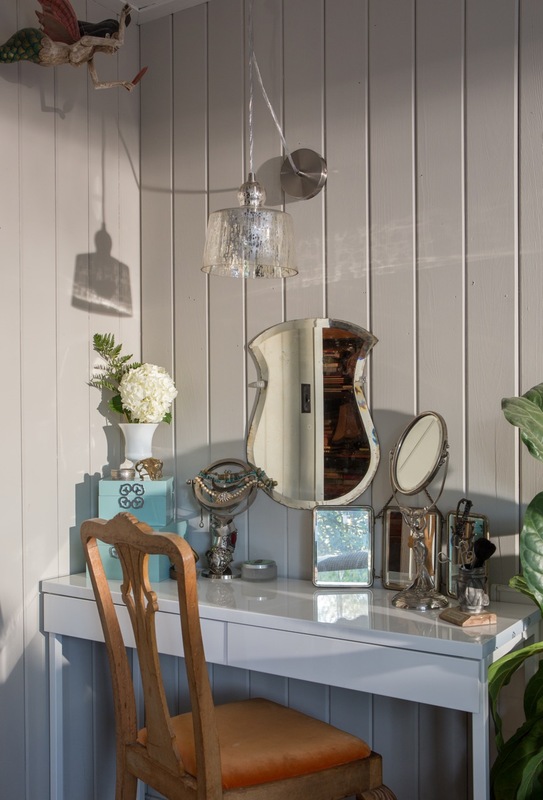 We love Shannon Ggem’s beautiful vanity from her lake cabin in the mountains of Malibu. Each item on her dressing table tells a story. From her husband’s golf trophy that now houses her make-up brushes, to the antique mirrors and Italian dining chair. 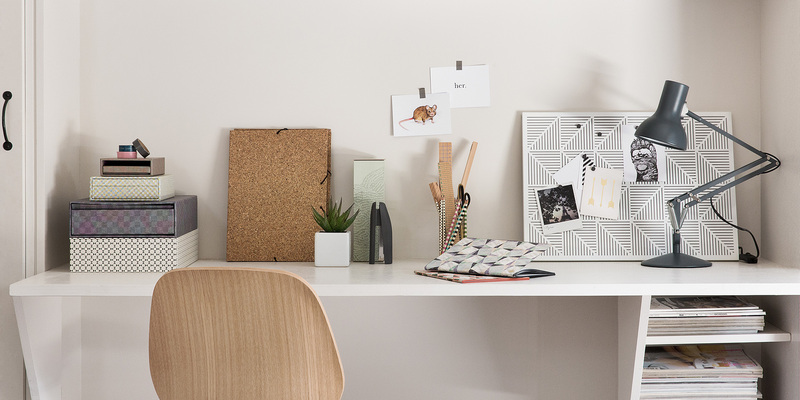 A sleek lacquer desk completes the look. Paul Langston’s kitchen is effortlessly stylish. 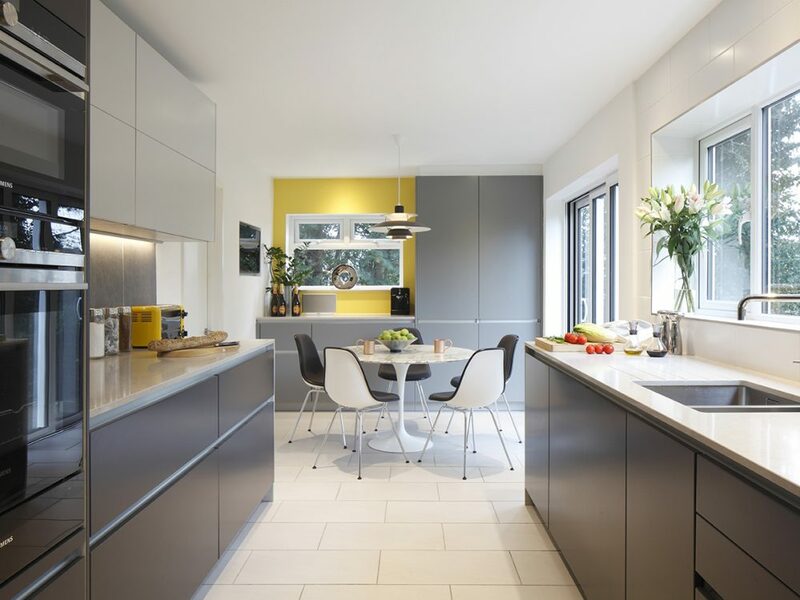 The grey cabinetry creates a modern and masculine space, while the look is kept soft with touches of yellow. White surfaces and flooring keep the room light and bright, and we are big fans of the Eero Saarinen style tulip table as a centrepiece to the room. Voila! 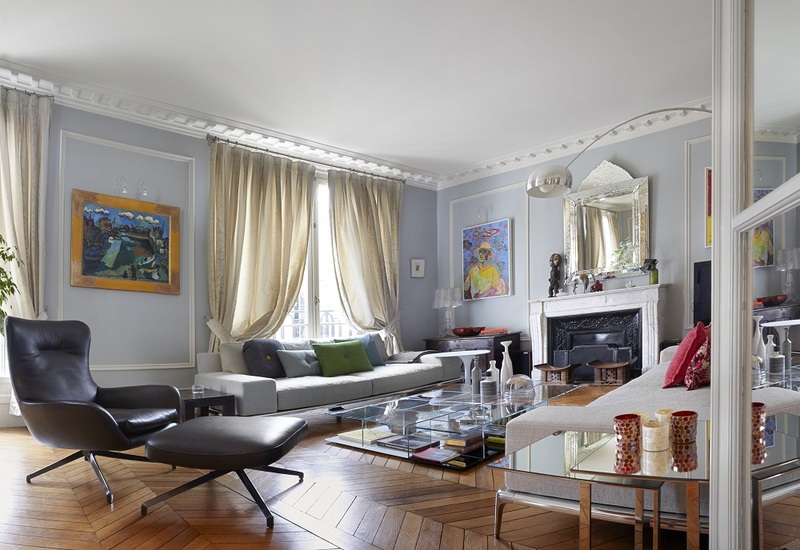 Peggy Dupuis’ Parisian apartment is a treat for the eyes. From the immaculate Herringbone flooring to the touches of mid-century modern in the furnishings and lighting, every aspect of the apartment is appropriately en vogue. The gorgeous full-height windows framed with soft draperies add a touch of glamour to this perfect Parisian apartment. 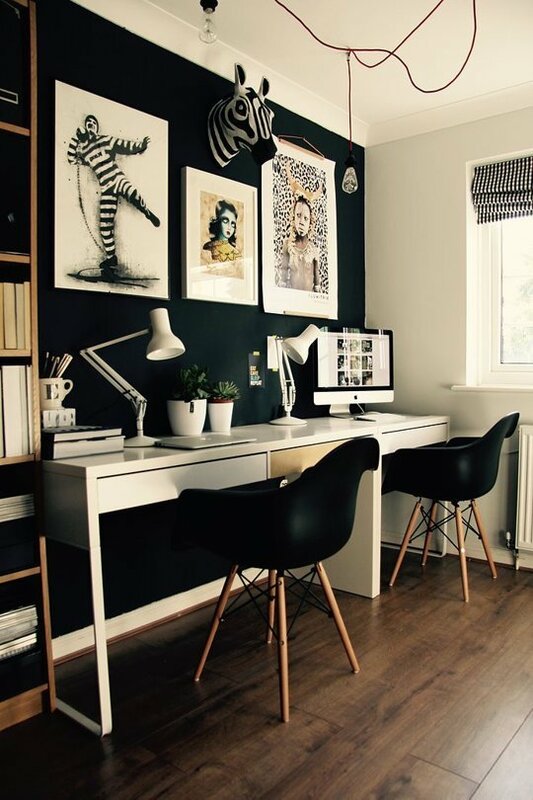 Jenny Kakoudakis goes back to black in her bold and beautiful study area. Her feature wall, in Farrow & Ball’s Railings, complements the monochrome accessories and creates an intimate working environment. We love the interesting wall decor, expertly placed to break up the expanse of dark colour. Elegance is the name of the game in Steve Cordony’s living room. Pale walls and furnishings create a haven of relaxation, while the greenery of the plants grounds the light-coloured surroundings. 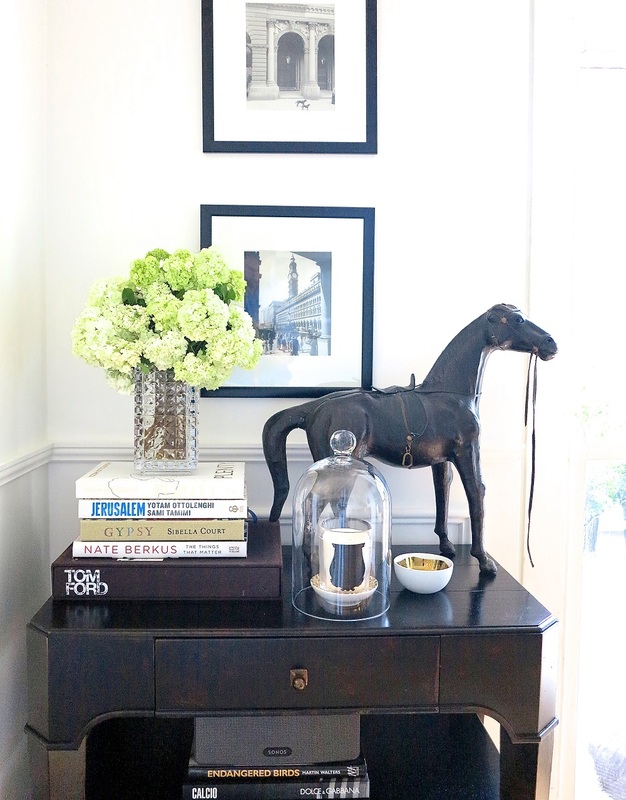 Like Steve, style a side table with objects of varying heights and sizes to add interest. There is a seamless transition between the outdoor and indoor in Hélène Dabrowski’s dining space. The glass double doors and skylight combination ensure the room is always light and bright. 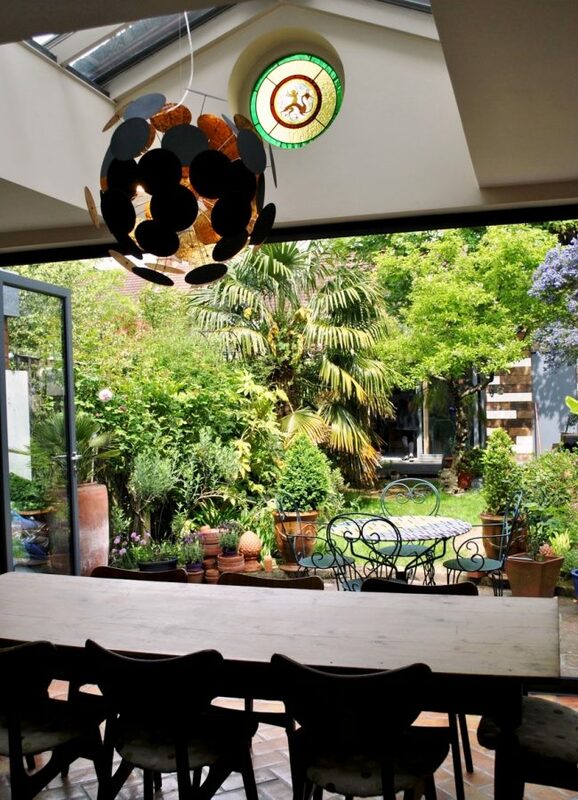 The sunburst-esque ceiling light is a nice touch, and is in keeping with the outdoor feel of the room. 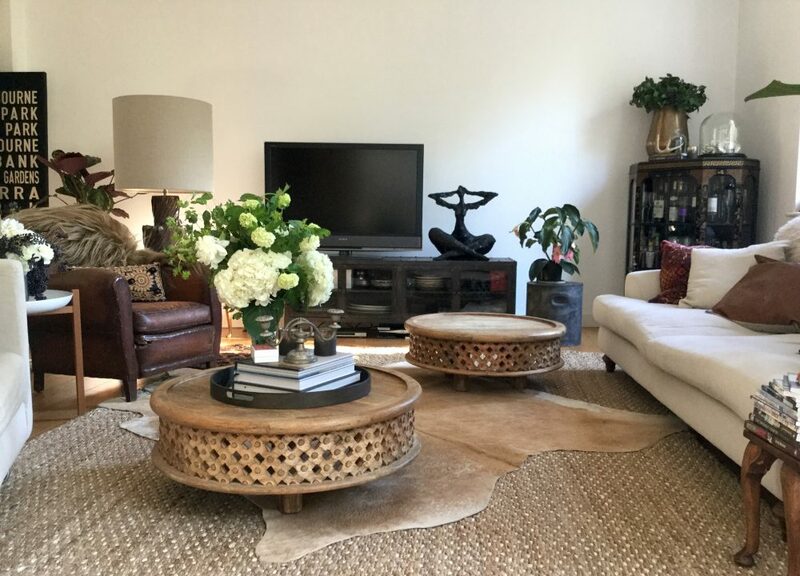 Susan Colebourne’s living space is a brilliant example of how to work with texture. In shades of earthy browns, Susan incorporates sleek leather chairs, layered rugs and patterned coffee tables. Interesting ornaments and plenty of greenery adorn the room. I love this post… probably because I’m nosey(!) but it’s really fascinating to see the way that the experts design their own homes. I have to say, Gianna Camilotti’s living space has to be my favourtie – it’s incredible.